Bangkok (Thailand) — December 19, 2018 (travelindex.com) — Visionary global hospitality brand, Capella Hotel Group is to unveil its first urban resort in Thailand: Capella Bangkok, set to open in the second quarter of 2019. 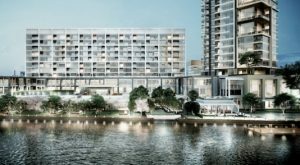 Taking up residence on the east bank of the legendary River of Kings (Chao Phraya River) the new luxury property is the first to open along the waterway in the last two decades. Designed to evoke the feeling of a personal pied-à-terre with unobstructed views of the river from every room, the luxury property features a signature restaurant curated by celebrated Michelin-starred chef Mauro Colagreco, Auriga Wellness with an extensive list of carefully curated Asian therapies combining traditional techniques with contemporary solutions, The Capella Living Room — a light-filled, river-facing lounge that will host local artisans, music and culinary delights to reflect the neighbourhood’s passion for food, wellness and culture.